But seriously, how many people smoke cigars today? Nevertheless, “Close, but no cigar!” is an idiom that still has currency today and is as instantly understood in the way as it has been for more than a century. 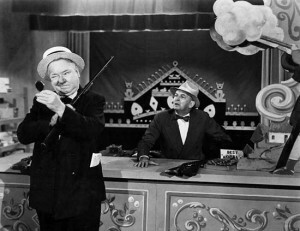 Comedian W.C. Fields at a carnival shooting gallery in Never Give a Sucker an Even Break (1941). You can’t really see it clearly in this small version of the above photo, but note the prize cigars in a box on the counter to the right of Fields, which is labeled Havana’s Best. The phrase is almost always an exclamatory comment regarding someone’s action or effort that just misses in being correct or succeeding. And what makes the idiom unique is that it seems to express two contradictory messages at the same time. On one hand the idiom offers praise and encouragement by recognizing how near an individual or group came to achieving a positive result, while on the other, it proclaims definitive failure. Which is exactly the kind of psychology applied till this day by the midway hucksters and barkers and carnies who operate games of skill, which is where the idiom “Close, but no cigar!” seems to have originated. While the citings on the web are kind of dodgy, the consensus among etymologists is that the expression emerged sometime during the mid to late 19th century when American carnival stalls offered a good smoke rather than a plush toy as the winning prize. By the 1920s and 30s “Close, but no cigar!” had become so familiar that it appeared in news accounts regarding political races, sports events and other win/lose situations far from the midway. In the 1935 film Annie Oakley, a fictionalized Chief Sitting Bull serves as matchmaker for Annie and her beau, Toby Walker, and the real Buffalo Bill Cody’s Wild West Show also makes an appearance. What really cemented the phrase “Close, but no cigar!” into the firmament of cherished American idioms was its appearance in the 1935 bio flick Annie Oakley wherein America’s sweetheart sharpshooter, played by Barbara Stanwyck, spouted the line “Close, colonel, but no cigar!” to the character of Col. William Cody, in reference to his shooting ability. 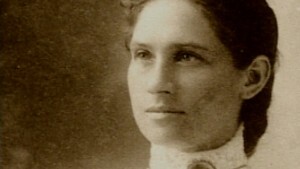 The real Annie Oakley, (1860 –1926) shooter par excellence, and quite comely at that. 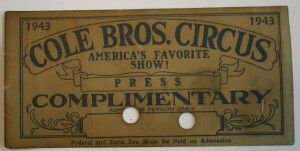 An “Annie Oakley” free ticket. 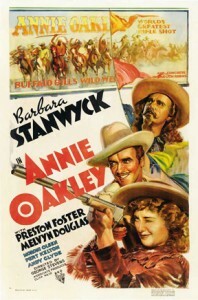 As a personal note, I can’t say whether the above Annie Oakley reference is still in use today, but I do know that in 1980, when I first arrived in NYC, a college friend who worked as a lowly assistant to a big time Broadway producer got me free tickets, which she referred to as “Annie Oakleys,” to plays and musicals, several times. This entry was posted on Tuesday, December 15th, 2015 at 5:32 pmand is filed under . You can follow any responses to this entry through the RSS 2.0 feed. You can leave a response, or trackback from your own site. Typo in the first subhead. “It’s Meaning”–should not have an apostrophe. Thanks for reminding me of the distinction between “it’s” and “its.” “Its” as a possessive pronoun doesn’t take an apostrophe, just like “hers” and his” (and “youse”, if you speak NewYorkese.) But seriously, folks, any copy editing help is always greatly appreciated. I had thought that “youse” in New Yorkese was the pleural form of the singular “you” that naturally evolved from European languages. For example, “Youse guys get out of here.” Formal Spanish “usted” and “ustedes” is quite parallel to this, and other European languages that I can think of (French & Italian) distinguish “you” singular from “you” pleural. In the southern USA, it is y’all or you’uns in the mountains. Thanks for the comment. Come to think of it, you may be “righter” than I (than me?). I love your word museum. Was searching for the etymology of the cat’s pajamas. Stayed for shirttail relative, close but no cigar, and the black and white photos. Favorited. Will return after work this afternoon. Now I must 23 skidoo.